Operators: Golubov G., Oshurkov M., Borodyaev U., Khilkov E., Vikhirev I., Epifanov G.
Admission Nikita Khrushchev in the Crimea governmental delegation of the Republic of Ghana. Meeting at the Vnukovo airport of the governmental delegation of the Hungarian People's Republic, arrived at the opening of the Hungarian industrial exhibition. Inauguration of the exhibition. Prime Minister of Hungary Ferenc Munnich cuts the ribbon. Members of the Soviet Government and of the Hungarian delegation visiting the exhibition. Bashkortostan, Ufa. The construction of the Ufa plant of synthetic alcohol. Work spidermen-riggers, electric welders, crane operators, masons. Shop polyethylene. Ambassador Extraordinary and Plenipotentiary Ambassador of Australia to the USSR DK Waller presents his credentials to Chairman of the Presidium of the Supreme Soviet of the USSR LI Brezhnev. Check out the demobilized soldiers of the Moscow district of the virgin lands of the Krasnoyarsk Territory. The soldiers in the carriages of the train. The girls say goodbye to the soldiers. Base Tyumen geological expedition on the banks of the taiga river Konda. Drilling Rig in the taiga. Works Bur. From the tube strikes oil. Geologists exploring oil. The test rover, created by the Central Research Institute Rafting in Leningrad, designed to accompany Rafting on the plains and mountain rivers. Terrain is on the water, on the ground. Harvesting of apples in the orchards of Moldovan farm Fruit Donbass ". Production of canned fruit in the shops of the collective cannery. Works conveyor. Loaded onto barges finished goods collective works. City of Moscow. All-Russia Exhibition of Folk Crafts in the Central Exhibition Hall (formerly the Manege). Wood products, carpets, Bogorodskaya toys and others. Czechoslovakia. XII-th International Film Festival in Karlovy Vary. Participants talk Film Festival. Speaker is the representative of the jury of the festival. The creators of the film "Serge" with the Grand Prix Festival - Crystal Globe. Ballet "Taras Bulba" composer VP Soloviev-Sedov on the stage of Bolshoi Theater performed by artists of the Novosibirsk Opera and Ballet Theater, located in Moscow on tour. 1. Admission Nikita Khrushchev in the Crimea governmental delegation of the Republic of Ghana. 2. Meeting at the Vnukovo airport of the governmental delegation of the Hungarian People's Republic, arrived at the opening of the Hungarian industrial exhibition. Prime Minister of Hungary Ferenc Munnich cuts the ribbon. Members of the Soviet Government and of the Hungarian delegation visiting the exhibition. The construction of the Ufa plant of synthetic alcohol. Work spidermen-riggers, electric welders, crane operators, masons. 4. Ambassador Extraordinary and Plenipotentiary Ambassador of Australia to the USSR DK Waller presents his credentials to Chairman of the Presidium of the Supreme Soviet of the USSR LI Brezhnev. 5. Check out the demobilized soldiers of the Moscow district of the virgin lands of the Krasnoyarsk Territory. The soldiers in the carriages of the train. The girls say goodbye to the soldiers. 6. Base Tyumen geological expedition on the banks of the taiga river Konda. 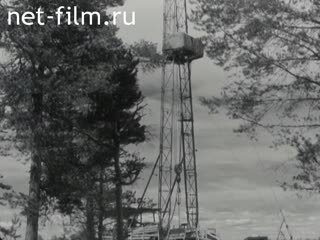 Drilling Rig in the taiga. From the tube strikes oil. 7. The test rover, created by the Central Research Institute Rafting in Leningrad, designed to accompany Rafting on the plains and mountain rivers. Terrain is on the water, on the ground. 8. Harvesting of apples in the orchards of Moldovan farm Fruit Donbass ". Production of canned fruit in the shops of the collective cannery. Loaded onto barges finished goods collective works. All-Russia Exhibition of Folk Crafts in the Central Exhibition Hall (formerly the Manege). Wood products, carpets, Bogorodskaya toys and others. XII-th International Film Festival in Karlovy Vary. Speaker is the representative of the jury of the festival. The creators of the film "Serge" with the Grand Prix Festival - Crystal Globe.